Over the last months was held the 4th edition of the “Ticket to America” competition organized by AmCham France. 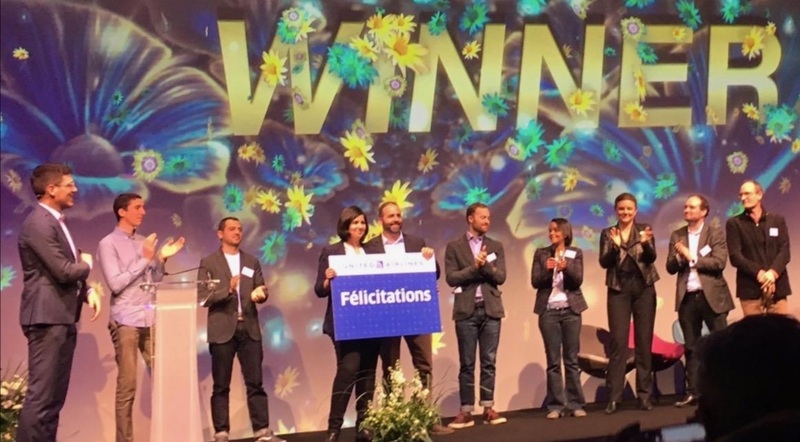 At the great finale in Disneyland Paris, our VP Customer Success Siham Taha successfully pitched in front of a jury of top innovators and global corporate giants to win the contest. The rewards include a comprehensive package to help Mapwize expand to the US: airline tickets to the US, Legal Assistance, Audit and Advisory services, access to the networks of both the AmCham and the French-American Chamber of Commerce of New York… We are very proud to benefit from this unique opportunity that will greatly help us with our expansion project! Don’t miss the two April stopovers of Mapwize World Tour! On April 9th, Mapwize is coming to Tokyo! For our first trip to Japan, our CEO Mederic Morel will welcome Japanese customers and prospects for a Breakfast meeting at Hotel Ascott Marunouchi Tokyo. The event will be co-hosted by our Japanese partner Oomnis. A few seats are still available, register now! On April 25th, Mapwize is flying to the US West Coast! Our CTO Mathieu Gerard will host an After Work event in the San Francisco area to meet with local experts, partners and customers. If you are located nearby, don’t miss this great opportunity to meet our team, discuss your projects involving indoor mapping and discover all the latest features of our platform. Find more information and register now! Emlyon business school chooses Mapwize! Mapwize is now available in Emlyon Business School campus in Ecully! Combined with the geolocation solution deployed by our partner Pole Star, Mapwize provides on-campus mapping and wayfinding services. Our solution is embedded within the official Emlyon’s App to help students find their way and locate services on site. Visitors can use the Mapwize App on the iPads available on campus, or by flashing QR Codes with their smartphones. Staff members also have access to a more detailed view of the campus. The Careers Forum - Emlyon’s flagship event – was held last January. For this event, Mapwize was used to facilitate booth reservations for exhibiting companies. The security of the Mapwize platform is a top priority. Accordingly, we have enhanced our login capabilities to encompass Single Sign-On (SSO). Enterprise customers can now better control who has access to their maps thanks to user authentication connected to their central identity management system. This feature is already used by several large European and American customers and is compatible with SAML, Azure AD and Google sign-ins. It can secure not only the access to the studio, but also to Mapwize mobile and web Apps. Are you interested in securing your maps, while simplifying the access for your employees? Contact us now!